This 2ME live switcher gives sure operability with an intuitive new UI design. The new AV-HS6000 is a new 2-M/E live video switcher with 32 HD-SDI plus 2 DVI-D inputs; 16 HD-SDI outputs; 16 keyers; 16 AUX Busses; 4 multiviewers; 4 DVEs per M/E; video thumbnail buttons; an intuitive GUI; and many other advanced standard features that make it a powerful; easy-to-use tool for advanced production in Sports; Broadcast; House of Worship; Staging; Education; and other demanding application. 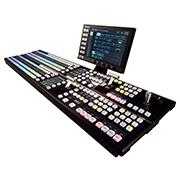 The switcher is configurable to meet an extensive range of production requirements; with options including a touch-screen menu panel with waveform; vectorscope; multiviewer; effects preview; extra Primatte chroma keyers; and internal video memory expansion up to 48 clips of approximately 60 seconds each. An extensive API will also enables the creation of a virtually limitless range of customized Plug-ins to suit new and emerging production workflow needs.